Green, touristy and overall impressive – that is how I saw the largest German state. Bavaria draws millions of tourists every year, especially in its southern region. Here lie the world-famous castles and palaces of King Ludwig II, also known as the Swan King, the Mad King or the Fairy Tale King. Ludwig became King of Bavaria in 1864, when he was 18. Though he always fulfilled his duties, the monarch had a mainly decorative role in matters of state. So Ludwig focused on pursuing his dreams: he began building theatres and castles, supported the arts and artists (he had a long-lasting friendship with Richard Wagner) and travelled through the alpine countryside. 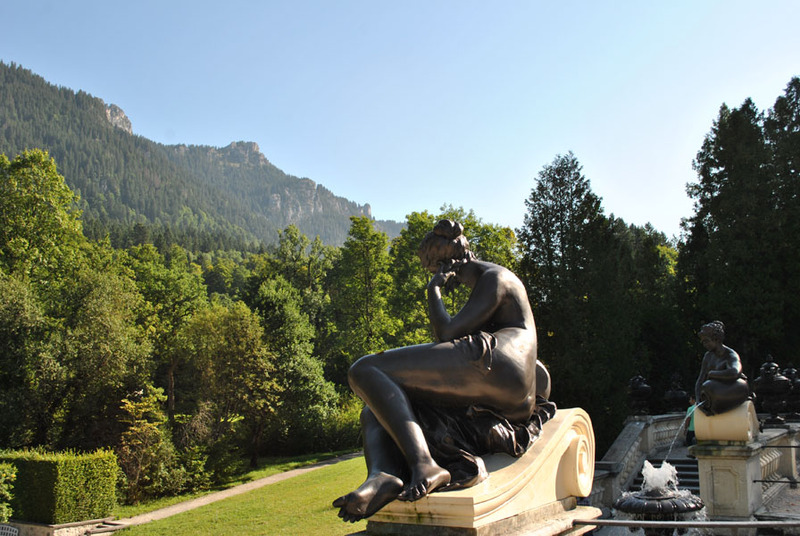 He was a visionary whose imagination and love of beauty left the world richer with three marvellous castles: Herrenchiemsee, Linderhof and the crown jewel – Neuschwanstein. In an attempt to decrease Ludwig’s expenditures, the government had the king declared insane (so unable to rule). On June 12th 1886, he was taken from Neuschwanstein to the Castle of Berg on Lake Starnberg, where he was found drowned the following day. Located in an idyllic setting, among majestic mountains, Neuschwanstein is a fairytale 19th-century Romanesque Revival castle. It was intended as a home for King Ludwig and it was open to the public shortly after his death. Since then, the castle has been visited by more than 61 million people. Every year, 1.4 million people visit “the castle of the fairy-tale king”, with as many as 6,000 per day in the summer. The exterior architecture and decoration of the castle are among the most iconic in the world. However, the interior is also impressive, with many rooms depicting the various operas written by Wagner. 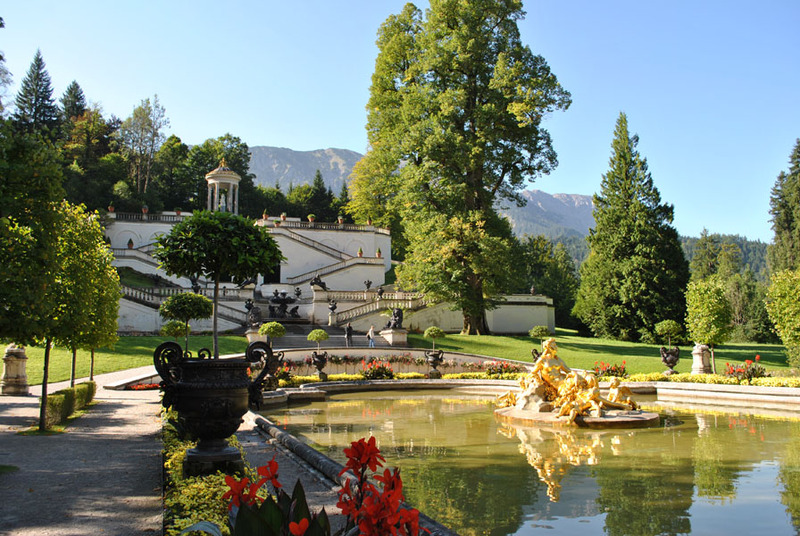 Linderhof is the only palace King Ludwig II lived to see completed. Initially, Ludwig envisioned here a large Byzantine palace, surrounded by a recreation of the magnificent park and gardens of Versailles. 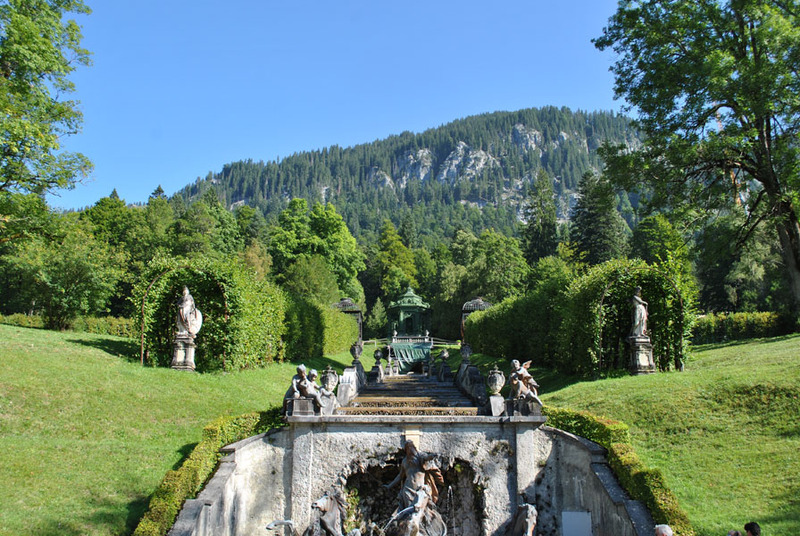 It was only when the king acquired the island of Herrenwörth in the Chiemsee in 1873, that he relocated the Versailles project there and allowed Linderhof to become this small, private and absolutely breathtaking complex. 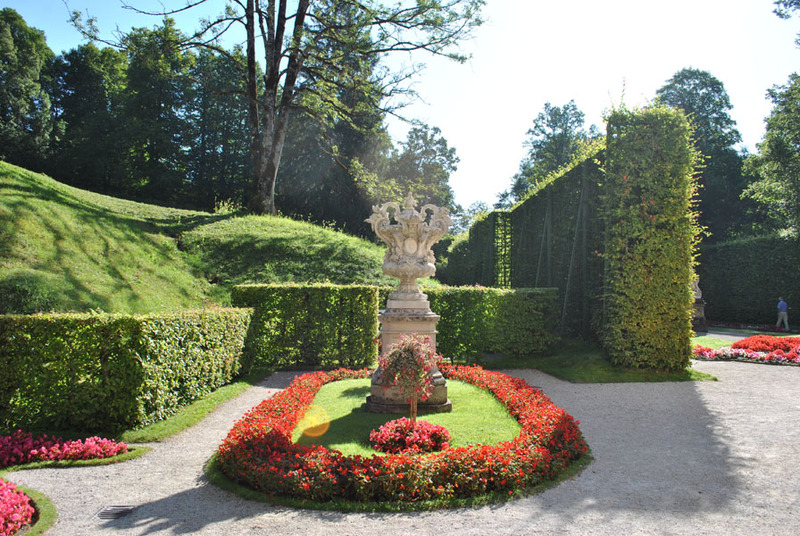 Though the palace in itself is rather small, the gardens surrounding it are considered one of the most beautiful creations of historicist garden style. 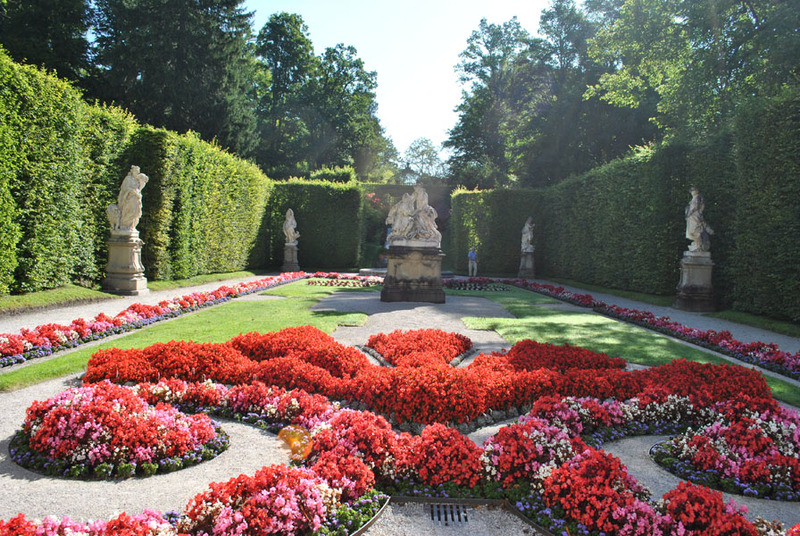 The park combines elements of Baroque design (the parterres), Italian Renaissance (the gardens and terraces) with English, French and Spanish landscape sections. Take a walk through the park and admire the large pool with the 25-metres high fountain, the three terrace gardens crowned with a round temple and the miniature waterfall with the Neptune Fountain at the bottom and the Music Pavilion at the top. Don’t avoid the numerous building, houses, grottoes, pavilions and kiosks strewn all over the park! Located in a wonderful setting, on the Herreninsel (the largest island in the Chiemsee lake), Herrenchiemsee was the true “Bavarian Versailles”. This new palace was built as a “Temple of Fame” for King Louis XIV of France, whom King Ludwig II fervently admired. 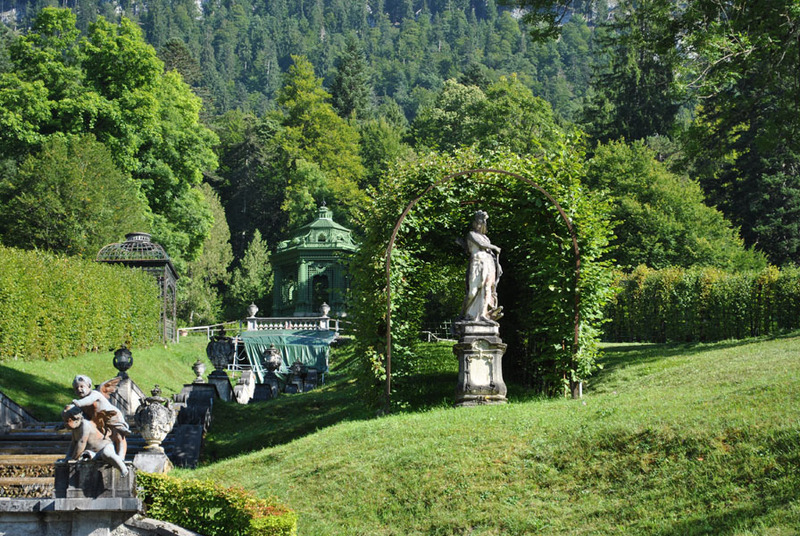 Enjoy a full day of strolling through these opulent gardens and bask in the monarchic splendour of King Ludwig II of Bavaria’s dream world!